A former CIA counter-terrorism chief, Maher Arar said, was once quoted as saying the U.S. response to 9/11 could be summed up thusly: the gloves came off. Arar, a Canadian citizen, came to public attention after he was seized by American authorities while transiting through New York on a business trip. He was subjected to the U.S.’s extraordinary rendition program and sent to Syria, where he was held for approximately a year, tortured and kept in inhumane conditions. Once he finally returned to Canada, a public inquiry found there was no evidence linking Arar to terrorist activity, and that Canadian officials had been complicit in his torture. Arar was well-placed to address the McGill Symposium on Counterterrorism and Civil Liberties, at the Law faculty on March 4 and 5. The event was an opportunity for lawyers, academics and advocates to weigh in on the debate over Western responses to terrorism threats, their effectiveness, and their compliance with human-rights standards. The event drew such high-profile speakers as documentary filmmaker Alexandre Trudeau, former general counsel to the Canadian Security and Intelligence Service and former RCMP complaints commissioner Paul Kennedy, as well as Paul Champ and Simon Potter, two of Canada’s most renowned human-rights lawyers. Participants took a critical look at how this country and others have fared in balancing antiterrorism initiatives with respect for civil liberties. 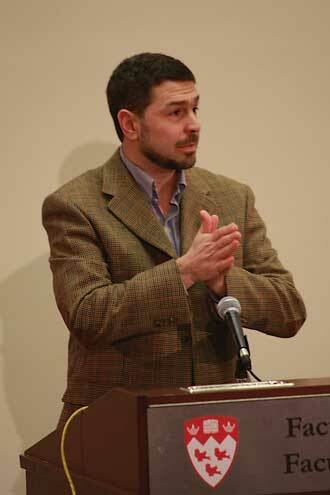 Despite all he has endured, Arar did have some words of praise for the Canadian government, congratulating it for launching two important official inquiries to address these problems (the Iacobucci inquiry on the detention of three men, and the O’Connor inquiry on the treatment of Arar himself), something no other Western government has done.